Always full of art nouveau style, Mucha Soir tapestry is from Mucha's collection of works entitled Les Heures Du Jour or 'Hours of the Day'. The famous Czech artist Alphonse Mucha produced works which used the female form to symbolise nature itself. Here, we are representing the evening, and in this tapestry we see a woman in an elegant evening gown resting by the woods, surrounded by delicate leaves and bordered with flowers. The softness and elegance of Mucha's works is especially seen in this piece with the delicate use of colors to convey the feeling of an evening approaching. 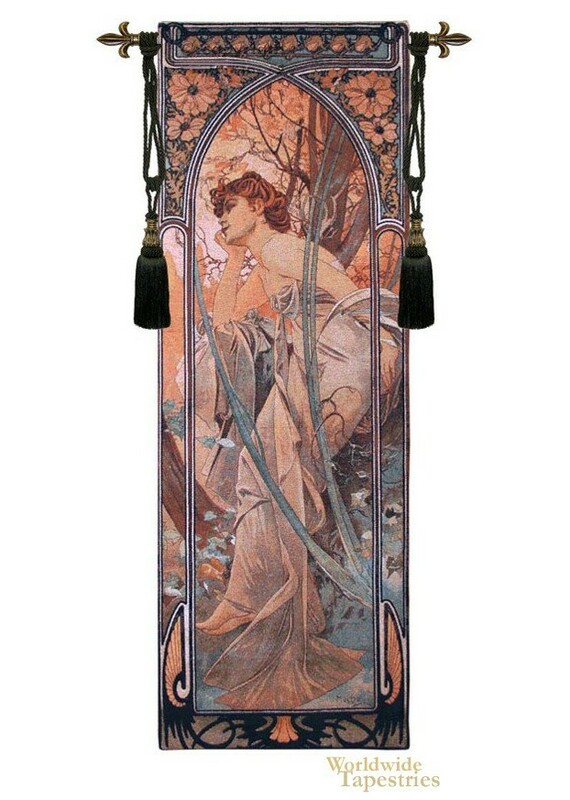 This art tapestry "Mucha Soir" is backed with a lining and has a tunnel for easy hanging. Note: tapestry rod and tassels, where pictured, are not included in the price. Dimensions: W 28" x H 76"